Start plotting Barnstaple lunch dates in your calendar as our very special Winter Warmer Lunch offer is back! Gather friends and family for an occasion or simply to be social and enjoy the good food that The Imperial Hotel are renowned for in our comfotable and opulent surroundings. Back for another year, our Winter Warmer Lunch menu offers 2-courses (mains & dessert) plus coffee for just £13.95pp from 1st January - 15th March 2018. Join us either in our Terrace Lounge, Colours Bistro or Arlington Restaurant between 12:00pm - 2:00pm Monday - Saturday to dine on this offer (excludes Sundays). When given advance notice we can cater for most dierty requirements, including lactose intollerance, vegans and gluten free - please advise us at time of booking. We will often send exclusive preview rates to our subscribers and periodic newsletters with at times, weekly offers. 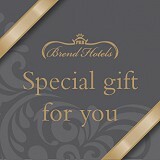 Imperial Hotel vouchers, our special gift for you. We currently hold four and half stars on Trip Advisor for The Imperial Hotel and Brend Hotels are holders of the accolade for AA Hotel Group of the Year 2015-16.